Here are two pictures of the same company’s premises – one is Rainsford and Company in the building they occupied in 1903, and the contemporary image shows the building the company had constructed twenty years later. The original building didn’t start life as a warehouse; very soon after a fire destroyed the city, the Methodist chapel was quickly rebuilt by the minister, Joseph Hall. Hall had built the first chapel on the site only weeks before it burned down in 1886; the Methodist parsonage was built earlier (on the same lot), in 1873 and services were initially held in the kitchen, then in 1875 the first modest ‘Indian’ Church was built on the same lot. (Next door was Birdie Stewart’s home, Birdie being the first recorded resident of the city to offer gentlemen the opportunity to share her girl’s company for an appropriate fee). George Schetky recalled lodging at the parsonage before the fire, and watching the trees being felled to the west by the CP Railway workers. Another early resident described the situation for the parsonage; the beach consisted of large boulders and kelp, with a path made by the Indians who pulled their canoes up onto the beach here. The location was generally quiet – except when the crows dropped clams from the beach onto the roof to try to break the shells open. By 1884 Methodist services were held in the Mill’s schoolhouse. When the two lots the parsonage and new hall occupied were conveyed to the Methodist congregation in 1886, only five of the seven trustees were actually members of the Methodist congregation; the other two William Soule (Church of England) and Peter Cordiner (Presbyterian) agreed to act as trustees for the greater good of the new community. In April 1887 Vancouver’s first band concert was held at the church, opening with The Maple Leaf Forever. The Methodists, with a new minister (brother of B.C. Premier John Robson) soon decided to build two new churches, one to the east on Princess Street in 1888 and one closer to the new CPR city centre on Homer Street, in 1889. The former chapel was quickly taken by John B Lovell of Victoria (who also owned the Bodega Hotel) and used as a feed and grain store by Henry Arkell. 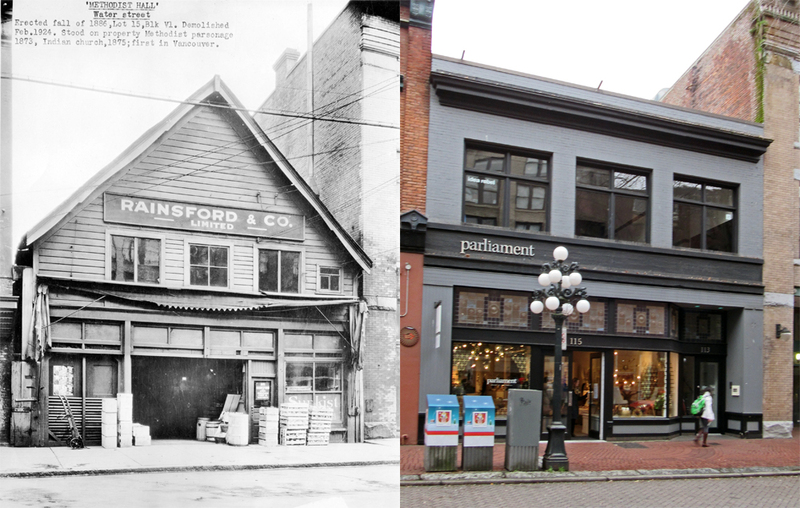 It was used by the mid 1890s by Welsh Brothers, flour and feed merchants, then by Fred Allen in 1899 (who had been Arkell’s clerk), and in 1903 Rainsford & Co occupied the space, fruit merchants whose business had previously been on Powell Street. They were still there in 1907, as we saw in an earlier post, and the two Rainsfords (son Clifford and father Benjamin) were both living on Beach Avenue. By 1911 the family had sold up, and moved to the North Shore. Benjamin’s occupation was described as ‘income’, while his wife Harriet and 27-year-old son Clifford had ‘none’. Rainsford and Co were responsible for replacing the building in 1923 with the structure still standing today – but by then there were no Rainsfords actually involved in the company. In 1911 it was run by Anderson Littlehailes and Guy Chellis. Anderson lived on Point Grey Road, and was from Monkwearmouth in County Durham, England, living with his wife, her mother and sister, while Guy lived on Arbutus Street, with his wife and daughter He was an American who unusually for the time declared no religious affiliation. Guy moved on from the company, but Anderson was still in charge 12 years later when the new building was developed. It was modest in comparison to some of the other warehouses along Water Street, and we don’t know who designed it, but as it was built by Dominion Construction it may well have been an in-house architect. By 1931 Rainsford & Co was managed by M G Hunter, and by 1941 the B C Coast Veg Marketing Board were in the building. We’ve seen another building built on this block around the same era, as a brothel. This building, dating from 1912, is often said to have a similar initial purpose, and some accounts say it was developed by Dolly Darlington. While Dolly, who was well known as a madam in the city undoubtedly ran her business here, hers wasn’t the name on the building permit (either as Dolly or Dollie, which was how it was sometimes spelled). For some strange reason the address was listed as 504 Alexander, but the lot was clearly lot 1 (the first on the block), the architect was pillar of the architectural community W T Whiteway, the owner was J McCarter and the $15,000 structure was built by Burrard Construction. We’re pretty certain the developer was Joseph McCarter, who was described in the 1911 census as a rooming house proprietor, originally from Ontario and living with his American wife Mary Ann and their two children and 10 lodgers. In the 1911 street directory Joseph was living on Cordova and was described as being in real estate. In 1901 J A McCarter, aged 29, was living with wife M Ann and both children in Nanaimo, and had a 21-year-old servant, George Warriner. Mary Ann’s name (according to her wedding certificate) was Mamie Hanna, and she had been born in Lyons, Iowa. The McCarters married in British Columbia in 1896 when Joseph was 24 and Mamie was 19. We suspect that Joseph intended to build a lodging house or apartments (which is how the permit is described) but circumstances seem to have changed that plan. That year city authorities clamped down on the brothels on Shore Street and Harris (now East Georgia) but let it be known that Alexander was a more acceptable location. Dolly was listed as living on Shore Street in the 1911 Census and from 1909 at 169 Harris Street in the street directory. (Before that Laura Scott had the Harris Street house, and Dolly’s name doesn’t appear so it’s likely that this was when she became an owner rather than a tenant). In 1912 Mamie, identified as ‘widow of Joseph’ is listed as “matron, C P R Dining Car Quarters” and seems to have left the city a year later. We suspect that Joseph built the building as an apartment building, and then Dolly acquired it when the nature of the street changed and Joseph himself was no longer around – having moved south. It looks as if Joseph and Mary’s son, William, (who was born in Nanaimo in 1897) headed to California; he was married there in 1917, drafted into the US Army in 1918, and died in San Bernardino in 1988 (when his mother’s name was recorded correctly as Hanna). Joseph got married in the US in 1912 to Nettie Orcutt – at 39 she was a year younger than Joseph. She was a Canada-born widow with three children. In 1920 Joseph was still living in California with his wife Elizabeth McCarter, who was two years older than Joseph, born in Ireland, with a stepson, George Agnew (they may have married in 1918 – there’s a wedding in Marin County between Elizabeth Agnew and Joseph McCarter, although their ages are completely wrong). In 1930 Joseph’s wife was Ada, seven years younger than him, and born in England, as was her son (so Joseph’s stepson) Roy Hanna. Ada had emigrated in 1917, and Joseph and Ada were still together in the 1940 census. Joseph Alexander McCarter was living in Sonoma, California, when his death was registered in 1950. Dolly Darlington is listed in the 1911 census as head of a household of seven other women, aged between 18 and 29, all from the US. Dolly herself was aged 27 and had arrived in Canada in 1905, and her ‘lodgers’ – some of whom were identified as bookkeeper and dressmaker – had arrived between 1906 and 1909. There’s no trace of anyone called Darlington with the name Dolly or Dollie being born in the US in the 1880s, so it’s possible she adopted an appropriate name for professional reasons. While further efforts were made to ‘cleanse’ the city in 1914, Dollie was still shown at 500 Alexander in 1915, one of only 6 possible remaining brothels on Alexander (while 18 of the addresses in the area were listed as vacant). Part of the building was used for a while as commercial property; in 1955 Western Engineering and Trading moved in, (William D Hubbard, president; diesel and engine parts) but the address was used by another Hubbard-related company as well. (We assume William and Alfred were related; in 1955 William lived on Sunset Boulevard in North Vancouver and was married to Shirley; Alfred was described as a research scientist and lived on Cambie with his wife Rita). Alfred Hubbard was born in the US but later became a Canadian citizen. In 1919, (despite only a third grade education in Kentucky), Hubbard invented the Hubbard Energy Transformer, a radioactive battery that could not be explained by the technology of the day. The Seattle Post- Intelligencer reported that Hubbard’s invention, hidden in an 11″ x 14″ box, had powered a ferry- sized vessel around Seattle’s Portico Bay nonstop for three days. Fifty percent rights to the patent were eventually bought by the Radium Corporation of Pittsburgh for $75,000, and nothing more was heard of the Hubbard Energy Transformer. Vancouver Magazine reported that during prohibition Hubbard took a job as a Seattle taxi driver and with a sophisticated ship-to-shore communications system hidden in the trunk of his cab, Hubbard helped rum-runners to successfully ferry booze past the US and Canadian Coast Guards. He was, however, caught by the FBI and went to prison for 18 months.After the war he founded a charter boat company and became a millionaire, acquiring a Gulf Island. In 1950, Hubbard experienced another angellic visitation telling him that something important to the future of mankind would soon be coming. When he read about LSD the next year, he knew that was it and immediately sought and acquired LSD, which he tried for himself in 1951. At various times over the next 20 years, Hubbard reportedly worked for the Canadian Special Services, the U.S. Justice Department, the Bureau of Alcohol, Tobacco and Firearms. He also worked at the Hollywood Hospital in New Westminster. During those years he introduced more than 6,000 people to LSD – including scientists, politicians, intelligence officials, diplomats, and church figures – and became known as the first “Captain Trips”, travelling about with a leather case containing pharmaceutically pure LSD, mescaline, and psilocybin. In 1955 Sandoz, the manufacturers of LSD shipped (via parcel post) 43 boxed of LSD to this building, addressed to Hubbard’s “Uranium Corp of B.C. Ltd”. There’s much more about Hubbard on the Past Tense blog. During the Hubbard years it became a rooming house using the Jackson Street entrance as the main address, initially as the Tyne Lodge Apartments and then the International Rooms. It was in a poor state by the mid 1970s (as our 1978 shot shows), and was acquired in 2009 by the Atira Development Society who carried out a careful and thorough heritage restoration, and then built the city’s first container-based housing on the adjacent lot. Once upon a time this house was considerably more decorative than it is today. And that once upon was a very long time ago – the picture dates from about 1890, and the house is one of the oldest in still standing in the city, dating to around 1889. It has water hook-up number 10 – the tenth building to be attached to the city’s new water supply, in 1889. The building’s first address was 430 Alexander, and in 1890 Thomas John Dales, a carpenter and Miss Florence Dales were listed in the street directory for the first time. We also find the first mention of T J Dales in the local newspaper that year when he was part of the entertainment for the fourth annual conference of the Methodist Church, held in Vancouver. T J Dales was listed as part of the ‘entertainment’ for the event; the nature of his entertaining wasn’t described, but if we had to guess we would suggest that he played the organ. We can find T J Dales in the 1891 census, aged 50, born in Ontario and living with his 38-year-old wife Louisa and their two children, Florence, age 21 and Mabel aged four. A year later Florence married William Douglas, a Scot, and we discover that she had been born in Newmarket Ontario. Two years later Murdock McDonald also lived here. From the notice of her death in Saanich in 1957 we discover that Murdock was married to another of Thomas and Louisa’s daughters, Viola, who would have been aged 20 in 1891. Thomas John Dales was born in Ontario, almost certainly in 1841 (although there are a few minor variations in different records). In 1868 he was living in Newmarket, Ontario, where he married Louisa M Bishop; he was 28, she was 16. 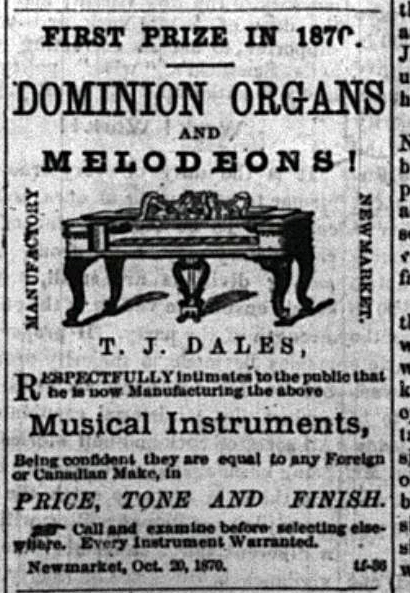 In the 1871 census he was listed as a Melodeon Maker, and in 1881 an organ manufacturer, still in Newmarket. In 1880 Thomas built a new brick home there, still standing today (seen here in a Wikipedia image). In the 1881 census three children were at home; Florence aged 11, Viola aged 8 and Leslie, 2. Leslie’s birth was recorded in 1879, but his death was recorded just under three years later before his third birthday. 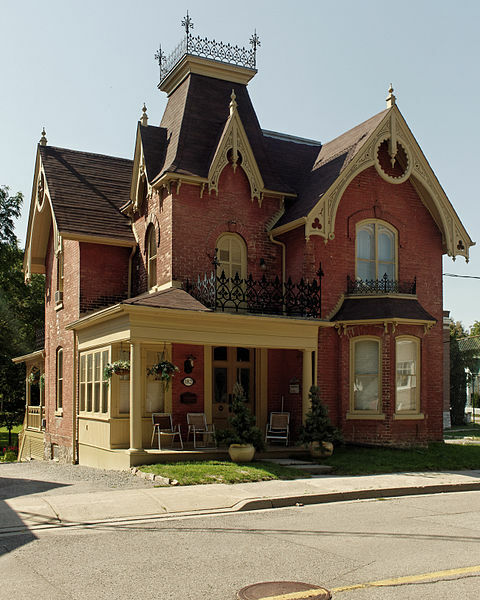 In 1883 Thomas raised $1,000 selling a property on Newmarket’s Main Street. We don’t know what brought Thomas and Louisa and their family west, but it seems likely that he did his best, given the materials available in their new location, to create something like the decorated home they left behind, and given his carpentry skills it seems reasonable to presume that much of the work was his own. The family didn’t stay in the house for long. In the early 1890s we find Thomas had moved to New Westminster where he was still a carpenter, in 1899 working for the Royal City Planing Mill, and lived at 209 Ninth. In 1901 the family had moved to Delta where Thomas, aged 59, was now a farmer; Mabel was still at home at 14 but had two younger siblings, William, 7 and Sarah, 5. In 1911 he was still in Delta and still farming, now shown as aged 73, Florence Douglas (his daughter) was living with him with her husband and his teenage grandchildren, William and Sarah, and his 80 year old father-in-law, William Bishop. We assume Louisa was there too, as we know that she lived until 1940, dying in Victoria where she lived, probably with her daughter Viola MacDonald. She was recorded at the time in the Newmarket Era newspaper as being survived by three grandchildren and 11 great-grandchildren, as well as numerous Ontario relatives. In 1892 the address switched to 414 Alexander Street and builder George Cary lived in the house. In 1894 C K Whittier lived here; a barber on Carrall Street. In 1896 he was replaced by David Ransom, who was a boom-man with the HS Mill (presumably the Hastings Saw Mill, just down the street). At the end of that same year the Vancouver Daily World recorded that Dr L M McLean, late of New Westminster had his office on Westminster Avenue, opposite the Glasgow Hotel and was living (at present) at 414 Alexander Street. In 1898 John Kerr was here; a merchant. From 1899 Mark Rose, a plumber and steamfitter lived here. The house would have been crowded: as well as his wife Annie there were four sons, three daughters and a lodger, 18-year-old Laura Rose. Mark and Annie, and the elder of their children had been born in PEI, but others were born in the US, and the youngest in BC. Laura was also from PEI, so perhaps a niece. In 1908 Joseph Rose was listed as the resident, Mark’s second son who had been 20 in 1901, as well as his father and brother, Samuel, who also worked for his father’s company. The Rose family finally left the house after 1910 when S Yoshie was shown here, the first of a decade of Japanese residents as that community gradually expanded from Japantown to the west. (Later the names weren’t recorded – just ‘Japanese’. After this through to 1950 it switched to ‘Orientals’). The photograph suggests that either the street was lowered, or the house was raised. We think it might have been the street grade that was changed; as with a number of East End streets, Alexander was graded for concrete sidewalks in 1909. Although much of this block of Alexander Street is now in commercial use, the house is still standing, and is still in residential use. What Thomas Dales would make of his former home being valued at over half a million dollars, we’ll obviously never know. The A R Williams Machinery Company of Vancouver built these premises in 1909. We saw the building they initially occupied on Alexander Street in the previous post. The company commissioned the design of their own building from an architect who had originally had been born in Galt, Ontario, Frederick Mellish trained as a builder and then practiced as an architect in Galt for many years. In 1909 he moved to Vancouver, and picked up a couple of jobs, including this building. The Galt connection undoubtedly helped; A R Williams (a Toronto based enterprise) had a partner in the Vancouver operation, the McGregor, Gourlay Company, Limited, of Galt, Ontario. The building cost $8,000 and was built by George Shrunk (or so the permit says – although there was nobody called that in the city – or Canada – as far as we can tell). There was another permit for a Williams-owned building designed by Mellish in 1913, with $3,337 of work built by Kinnett & Tinney & Co. We assume it was this building – the permit identifies ‘foot Jackson’ – and this building faces Jackson. The work was probably to enlarge the premises to allow the company to consolidate to one location; they moved out of their Alexander building around 1914, and remained in this building for many years – at least until 1955 when our supply of street directories dries up. Very little changed between the early 1920s (above) and 1935 (below). Today the building is home to a showroom and furniture manufacturer and an architectural model maker. This modest warehouse was built in 1907, and we can find no record of the builder or architect. The first tenant was the A R Williams Machinery Company of Vancouver. Thanks to a 1907 publication, (A history of Ontario : its resources and development), we know that the Vancouver operation was part of a larger Toronto company, with a partner owner from another machinery company, Gourlay’s of Galt (who in 1900 opened the only factory in Canada that manufactured pins). “The business conducted under the above name was founded in 1883 by A. R. Williams, and embraced operations not only in the purchase and sale of machinery, but also in the conduct of a repair shop in addition to the manufacturing department. This was organized as a limited company in 1894, capitalized for $300,000, with a subscribed capital of $188,000. The company handles iron and metal working machinery of all kinds, tends to the outfitting of machine shops, agricultural implement shops and railway shops; also handles wood working machinery, covering complete outfits for planing mills, furniture factories, sawmills, stave, lath and shingle mills, and in fact covering every process for working up wooden and iron products. They likewise furnish power machinery, including engines, boilers, gas and gasoline engines, gas producer plants, electric generators and motors, water wheels, water motors, etc. As far as possible they handle Canadian made goods of all kinds. In 1909 Williams built new premises on Railway Street, and for a while occupied both, but by 1915 this building was vacant. In 1916 Hallman & White, machinery (Emil Hallman and Conrad R White, Machinery & Belting) moved in. They stayed a very short period, in 1918 and 1919 it was vacant again (a new partnership of Hallman & Cleghorn were dealing in machinery on Hastings). In 1920 the Crossman Electrical Machinery Co moved in, and stayed until 1941. The company was founded in 1911, and is still in business today, based in Burnaby supplying electric motors, processing and conveyors just as it was in this 1921 Vancouver Public Library picture. From 1942-44 the directory says this was “Dom Prov Sch” – which turns out to have been the Shipbuilding Training Centre for the Dominion Provincial Youth and War Emergency Training Plan. In 1946 the War Assets Corporation was here – Its mandate was to manage the surplus moveable assets disposal program for the government. In 1948 the address disappeared, along, we assume, with the building. Today it’s part of a larger site developed in 1999 with an eight storey condo building designed by Rositch Hemphill for Cressey. We’ve got two views of this small warehouse building squeezed in between the rail tracks and Alexander Street as it curves towards the tracks. In 1919, when the picture above was taken the newly arrived owner was the H G White Manufacturing Company who were the home of White Seal products. There were White Seal apples in Tasmania, White Seal lard in the US, White Seal beer and White Seal tinned salmon in British Columbia, but H G White didn’t sell any of those – the company was described as ‘manufacturers agent’ in the street directory – but what they manufactured wasn’t identified. Harold G White lived on Cardero Street, and we’ve discovered that White Seal was a brand of fur mittens. Originally, when the premises were built in 1913 this was occupied by the builder and developer, E Cook, designed by W M Dodd, an architect who designed a series of automobile-related buildings in the city as well as apartment blocks. Edward Cook built warehouses on Water Street and Woodward’s big new store on Hastings, so this investment was a relatively modest piece of construction for him. While he occupied the building he also ran his other business from here, the Columbia Clay Co. who had a brickyard located on Anvil Island at the north end of Howe Sound. He was born in Perth, Ontario, and after learning his trade as contractor in Manitoba arrived in Vancouver in the spring of 1886. By 1891 he was responsible for building around 40 of the city’s new business blocks. By 1915 this was the warehouse for Jacobson-Goldberg, a fur trade business. (Isaac Jacobson was a furrier who lived on Ontario St and L Goldberg lived in the London Hotel; before they moved here they were in business on Main Street.) In 1916 they shared the building with B C Grinnell Glove Co, a company who also made sealskin gloves, for loggers, steel workers and lumbermen. (In 1914 they were located in Coquitlam). Nelson and Shakespeare (Arthur Nelson, of North Vancouver and W B Shakespeare who lived in the West End) wholesale confectioners took over the premises for three years in 1917. That year H G White was partnered with Benjamin Harrison, who lived in West Vancouver, and they were importers with premises on Hornby Street (he initially worked for Harrison, and then became a partner). In 1920 Nelson and Shakespeare moved to another warehouse across the street and H G White moved in, manufacturing sealskin gloves again, although still in the import and export trade. Harold White claimed in some records to have been born in England in 1889. That seems to be the correct year: he arrived in Canada in 1906 with his parents who had apparently initially emigrated from England to Canada in 1881. However, in the 1911 census Harold and his sister Eliza (still living with their parents) are shown as being born in Michigan, USA, so presumably the family moved south of the border for a while. In 1919 he was living on Nelson Street, and in 1923 he had moved to Cardero and was listed as Consul for Peru, and Harrison’s company was once again BR Harrison and Company, now based in 325 Howe Street. By 1924 Harold White was no longer in the directories; in 1940 he appears to have moved to San Francisco with his family – an easier move for someone born in the US. The image above was taken in 1929 when the building was for sale. The more substantial building to the east beyond the narrow gap that was a track that crossed the rail lines has apparently been masked off. You can see the adjacent warehouse a little more clearly in this 1933 Archives shot that we can’t reproduce these days as it’s taken from inside the Port security area. 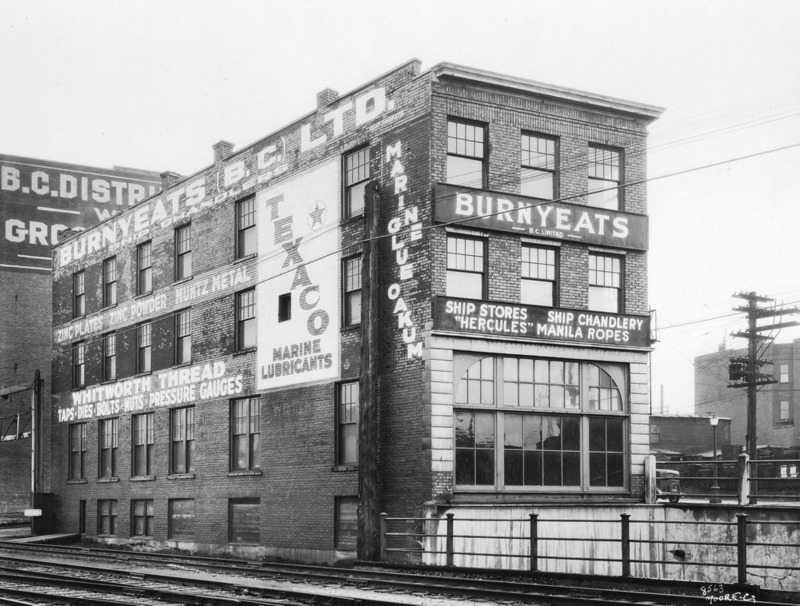 Gordon and Belyea had been using 157 Alexander for some years – they were listed as ‘Mill, Mining, Railway, Marine and Waterworks Supplies’, and had been in a building across the street earlier in the 1920s. They moved to a larger property in 1929, and the sale offering suggests they might have acquired the building rather than tenanted it. In the 1933 image Burnyeats and Co were occupying the building – they were ship’s chandlers. Scout Magazine outlines the building’s more recent history: In later decades, the address’ upper storeys were converted into offices, and by the 1970s the ground floor was known as the Banjo Palace, a 20’s-themed club, supposedly boasting the country’s largest circular barbecue. The owner, George Patey, had purchased pieces of the brick wall involved in the St. Valentine’s Day Massacre and had it re-constructed in the men’s room (the wall was shipped from Chicago in 7 barrels, and after the nightclub failed it was removed again). Prior to the Alibi Room who still occupy the space today the building was home to the Archimedes Club, a watering hole for Vancouver’s taxi drivers where a signature on the membership book got you access to $5 pitchers (or so go the legends). It’s unusual that a street configuration has changed in Vancouver, but here’s an exception. The Fleck Brothers warehouse (as it appears in 1934 in this Vancouver Public Library image) was in two sections, one fronting Alexander Street, and one fronting the rail right-of-way that ran all the way from False Creek at a diagonal angle through the East End. Elsewhere that right-of-way still exists today, although the tracks have long gone, but this 1934 image shows how the warehouse angled round the corner. The first element of the warehouse dates back to 1898; the third fourth and fifth bays (closest to the corner) were W J McMillan’s warehouse. McMillan arrived in Vancouver from Victoria soon after the fire of 1886 – so had the advantage of having lost nothing in the fire, but ready to build a business in the frantic re-construction that followed. He was originally from New Brunswick (although the town he was born in is now part of Quebec). Leaving home in 1880 he farmed with two of his brothers in California before moving to Portland to work for the Oregon Railway and then Victoria in 1883 for the Island Railroad Company. In Vancouver he switched gears completely, and opened a fruit and produce store on Cordova, and then Abbott Street with two partners, (one, R J Hamilton, his cousin). When their new warehouse was built they were identified as McMillan and Hamilton. At some point the next two bays to the east were added – we don’t know who designed the original building or the addition (probably the same architect). By 1902 the partners had taken over the Kootenay part of the business, and W J McMillan & Co remained in Vancouver with William and his brother Robert growing “one of the largest grocery houses of the Canadian west”. In 1912 they moved to Beatty and Smithe to a building they had Thomas Hooper design, and a sailmaker, C H Jones & Son (Charles and Fred Jones) occupied their space with Edward Blackwell, a machinery wholesaler. Jones & Co moved in 1918 to 28 Water Street and this building was vacant for a while. It appears that sugar and real estate baron B T Rogers had acquired the building; in 1916 he hired Somervell & Putnam to carry out some minor repairs to the building. Fleck Brothers were another early arrival to the city; J Gordon Fleck and Bryce W Fleck were running their company in 1908, operating as manufacturers agents for Roofing, Lumber, Paper etc. from an office on Seymour Street. They moved to this building in 1921, and in 1941 hired W F Gardiner to add 2 additional floors, using a steel frame rather than the heavy lumber frame of the original structure. Once the CPR had stopped running trains through the streets they acquired the right-of-way, and in 1951 added a wedge-shaped addition to their premises. They also bought the warehouse on Powell Street across the lane. The company continued in business well into the 1970s, but as with most of the warehouses in this area, more efficient operations saw the use cease. In 1988 the building was converted to residential use, with a new structure replacing the right-of way as a part of the Four Sisters Housing Co-operative, designed by Davidson and Yuen Partners for the Downtown Eastside Residents Association.